A regular website is usually designed for viewing on a desktop computer. When viewed on a smaller mobile device, the user experience isn't that great as certain elements from the site might not appear or may not function optimally. Mobile-optimized sites solve this problem by creating a version of the website that specifically designed to look great on all mobile phones. In addition, mobile websites may also include features that take advantage of the advanced capabilities of a mobile phone such as a click-to-call button that, when clicked, places a call. The main benefit of a mobile optimized site is providing a great overall website experience to your mobile users. With over 70 million Americans and 58 million Europeans browsing websites from their phone every month, it has become a necessity to provide a quality mobile experience and provide quick access to information about your business. 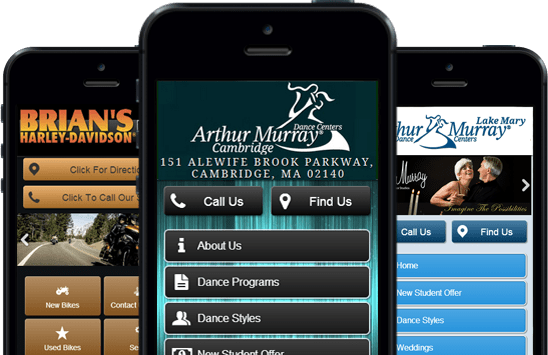 A mobile optimized site also helps convert mobile traffic to customers by using special mobile website features like Click-to-Call and Mobile Maps with Directions. When a user types in the URL of your regular website on their phone, they will be automatically redirected to your mobile site. What’s the difference between a mobile app and a mobile website? A mobile app is a native software application that can be downloaded and installed on the user’s smartphone. Mobile apps can include some interesting features, such as push notifications. A mobile website is a smartphone-friendly version of your website. The mobile site will have large easy to tap button, and content that is formatted to fit correctly on a mobile screen. This way your customers don’t have to pinch and zoom to find what they’re looking for. This website will display automatically when someone tries to access your site from a smartphone. No downloads necessary. Which is better, a mobile app or a mobile website? A mobile app can be an interesting marketing solution, as they can have additional functionality that mobile websites do not, but they are typically more expensive and they do not negate the need for a mobile friendly website. Customers looking for business information from a mobile phone want quick access to the business hours, phone number, and location. If they can't easily find that from the mobile website, they'll move on to the next one. A mobile website instantly connects your customers with the information they are looking for. The majority of mobile searches for local businesses are from consumers who are looking to buy immediately. If you're searching for Chinese food from your mobile phone, you're probably looking to order Chinese food. Mobile apps must be downloaded and installed, which is an extra step that most potential customers just won't take when they're casually browsing businesses or just looking for quick info on the go. Native apps are mostly useful for existing customers, who already know and like your brand enough to want to install the app on their phone. The app provides the ability for returning customers to view specials, push notifications, and company info, but it isn't useful for the casual new customer who isn't familiar with your business. If a company creates a mobile app, they should still have a mobile friendly website. Besides, they're usually much cheaper. Is there some sort of hosting or maintenance fee? Yes, the monthly fee is $6 a month. This includes the mobile hosting, auto-sync with the original site, and mobile updates, ensuring your customers constantly have the best experience.